Today, New America’s Education Policy Program released the fifth and final brief in a series analyzing new survey data about what prospective college students know about the college-going and financing process. Part V: Searching for the Right College focuses on prospective and recently-enrolled college students’ experiences finding and using information to make their college decisions. 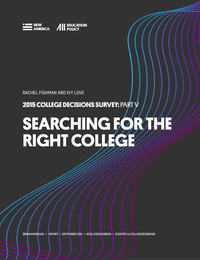 College websites (63 percent) and online search engines (59 percent) were the most popular sources of information that prospective and recently-enrolled students used to learn about colleges, but some students faced difficulty locating important information. Forty-three percent of students using college websites had trouble finding how much a college costs, and 42 percent had trouble finding information about financial aid and scholarships.